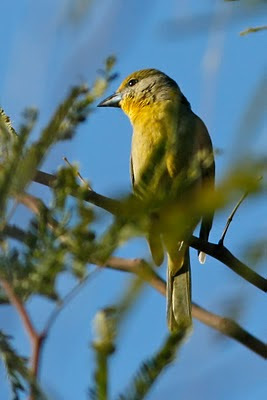 Yesterday late afternoon I had a tanager show up briefly in our mesquite tree. What caught my ear was its unique single-syllable call that it was repeating every couple of seconds. It stayed about 3 minutes - long enough for me to locate it, go inside and get my camera, and then take a couple of photos. 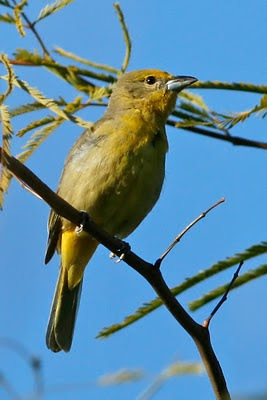 I'm still relatively new to Arizona, but based on what I know about tanagers a winter appearance is not common. According to distribution maps in my field guides, Hepatic Tanager is the only regular winter tanager, with a range limited to the southeast Arizona 'sky islands'. While my location is fairly far south in Arizona, it is in the low desert in an area with little habitat diversity (aside from the young trees and shrubs planted in our small community). It's fairly distant from typical Hepatic habitat. I was leaning towards identifying this as Hepatic due to bill proportion, head shape, the grayish auriculars, and the single-note call. This identification was confirmed by a number of experts on the BIRDWG05 forum. And in the mean time it has already made another appearance on Feb 1. This is indeed a good find – your field guides are correct in the winter distribution and status. They are regular (but still rather rare) in winter only in the pine-oak woodlands close to the Mexican border in Santa Cruz County. There were 3 on the Atascosa Highlands CBC and one on the Patagonia CBC. Last winter we had a ridiculous 27 on Atascosa Highlands, but that was not normal. Late migrants? Just read some of your blogs. I found the link of BirdWG05. I love Arizona and its nature. Some amazing shots you have. I also take lots of pictures... you can see them at barkingdawgs.com. I am one of the owners of the Native New Yorker in Maricopa. One day we can meet there and I'll buy you a beer (or soda..).